It's been forever and a day since I wrote about fashion trends. But there's one out there right now that's just been calling my name what seems like incessantly ever since I first came across it -- and I simply have to share it with you! And that's the trend of denim sweatshirt jackets. The denim sweatshirt jacket really is the epitome of casual cool. 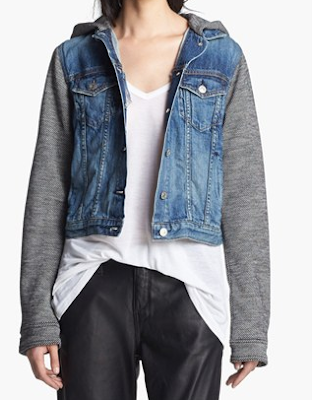 (Just check out the Rag & Bone/JEAN Hooded Jean Jacket above for proof.) 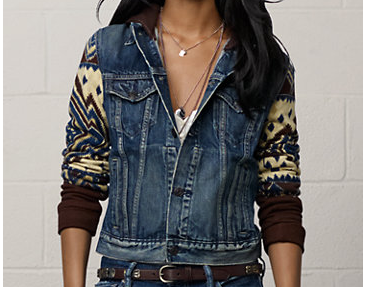 A denim vest body, combined with fleece sleeves and hood, brings the best of two relaxed worlds together. Below, a few of my favorite takes on the trend. 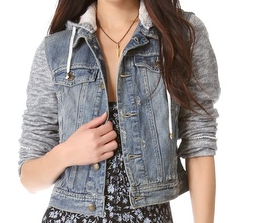 What looks like a regular jean jacket in the front brings this trend to life with a fleece hood and shoelace ties. It's screaming for a kicky skirt and ballet flats. Take the trend to the next level with preppy patterned sleeves. Give your look a little edge with heathered sleeves. I wish I had bought ours before it sold out!! So do I! I'm so bummed I missed out on it.